You can now add responses to your Amazon Lex chatbots directly from the AWS Management Console. Use responses to set up dynamic, engaging interactions with your users. Responses are the final element of a bot’s intent, and are displayed to users after the fulfillment of the intent is complete. A response might include anything from a simple goodbye message, to a carousel of pictures with different buttons that invoke another intent, to a prompt. Responses can even be the main element of an intent for some use cases, such as an intent that helps guide the user toward different bot functions. A response could be just that simple, suggesting that the user respond with a statement that triggers another intent. For example, the user might respond “Car rental.” If “Car rental” matches the utterance for an intent to help rent cars, that intent is triggered seamlessly. Responses are available in the Amazon Lex console and through the Amazon Lex SDK. Let’s walk through the components to show how to build a response. You can create one or more message groups for a response which may help craft a more natural conversation flow. Messages are sent to the client marked by message group (message group one, message group two, and so on), so each group is automatically displayed on separate lines for supported Amazon Lex channels, such as Facebook Messenger, Slack, and Kik. To display messages similarly on custom clients, you can opt to write logic to keep this behavior consistent. To apply custom formatting with the Amazon Lex SDK, use the CustomPayload parameter. You can set the format for each message group individually, allowing you to alternate between formats. For responses that can have “No” as a reply, you can create a closing message. This is also a nice way to conclude the conversation if the user is finished. Response cards are the next component in the Responses section of the Amazon Lex console. A response card contains a set of appropriate responses that a user can select from and an image or graphic. Response cards can enrich and simplify interactions for your users, while increasing your bot’s accuracy. 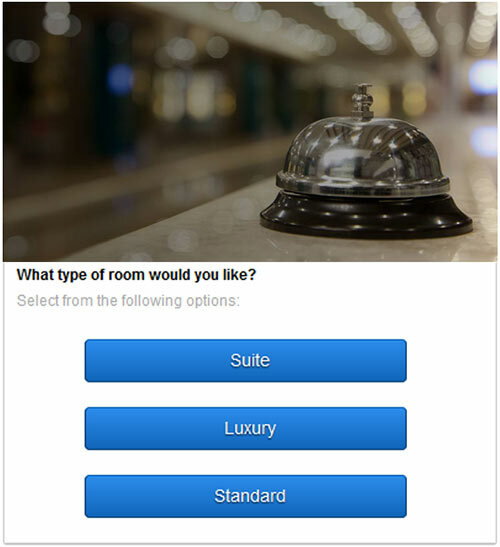 For example, in a hotel booking application, you can configure each button in the response card for a different room type. When the user chooses one of these buttons, the button value for that room type is returned to Amazon Lex to trigger a new intent. To let the user scroll through options, you can enable a carousel of response cards. In our hotel booking example, each card in the carousel could represent a different hotel, city, or popular resort. To review your responses, use preview mode. If your message groups contain multiple messages, you can see another response by choosing Refresh response. To return to the editor, choose Exit preview. Responses work natively across the supported Amazon Lex channels (messaging platforms), such as Facebook Messenger, Slack, and Kik. You can also program your custom clients and mobile applications to use responses, including response cards. To create responses in the console, choose a bot (or create a new one), and fill out the Responses section at the bottom of each intent. All responses require at least one message group with at least one message. For more information on building responses in Amazon Lex, see the Amazon Lex documentation and FAQs. Want to learn more about developing chatbots with Amazon Lex? Learn how to build better bots with our two part tutorial! John Reed is a Senior Product Manager with AWS Deep Learning and AI Consoles. He works across AWS AI technologies to improve the user and developer experience. In his spare time, he enjoys tinkering with gadgets, skiing, backpacking, and other outdoor activities.